Botox wrinkle reducing injections work by reducing the contraction/activity of the muscles that cause persistent frown lines. Botox toxin type A is a purified protein produced by the clostridium botulinum bacteria. Results can be noticed within a few days and can last for up to 4 months. Over time the natural volume of youthful skin begins to diminish as wrinkles and folds form. Dermal fillers such as Juvederm are a smooth consistency gel made of hyaluronic acid, a naturally occurring substance in the skin. This adds volume and hydration. Dermal fillers are commonly injected into the lips to add definition and volume, and the smile lines to immediately hydrate and lift the soft tissues. 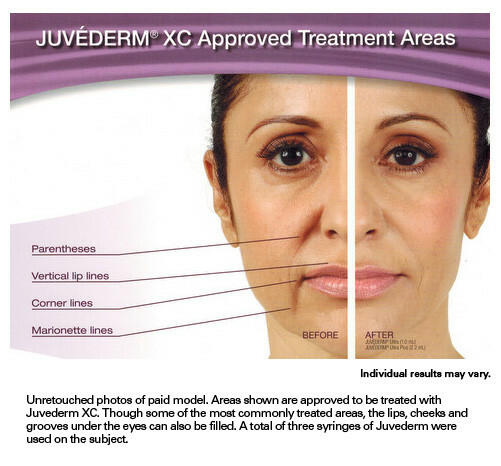 This results are a natural and youthful appearance that can last up to 6 months.